In sanskrit, Chaturanga Dandasana translates to “four(Chatur) limb(anga) staff (Danda) pose (asana). Often mistaken to mean high and low plank pose encompassed in the one cue “Chaturanga”, it is actually low plank pose. High plank, or kumbhakasana is its’ own preparatory pose! Chaturanga Dandasna originates from the Ashtanga Lineage of yoga and is designed to build internal heat from a place of anchored resource. It strengthens arms, shoulders, wrists, core, and back body. This calls for mindfulness. Yet, given Chaturanga is often “called” and not “taught”, while done in a transitional sequence, we can fall into the trappings of unchecked repetition and form habits. Because vinyasa yoga is about stacking joints and bones, repetitive poses done with improper alignment and awareness can lead to progressive strain and even make a person more susceptible to injury. Chaturanga Dandasana asks for a devoted awareness to whole body alignment and it mirrors how we flow between the balance of effort and ease in transitions. On and off of the mat. Do we go rigid and muscle our way through? Do we check out completely and hope for the best? Or do we use our inner strength and move from challenge into resource, as we mindfully move through an experience? Are we observing the wisdom that sensation can bring to us? Checking in with Chaturanga can deepen your understanding of the mechanics of the pose, reflect patterns of behaviour and invite you to tune into your own inner resources. Study and practice preparatory poses to build strength. Learn whole body alignment of the pose, along with modifications. Learn the common pitfalls and how to tell if you are doing them, like sway back compression, omitting the toe roll, splaying elbows,etc. A great way to get support is to connect with your yoga instructor before or after class or look for workshops in your community. In doing so, you are investing in self and an ever-evolving yoga practice. 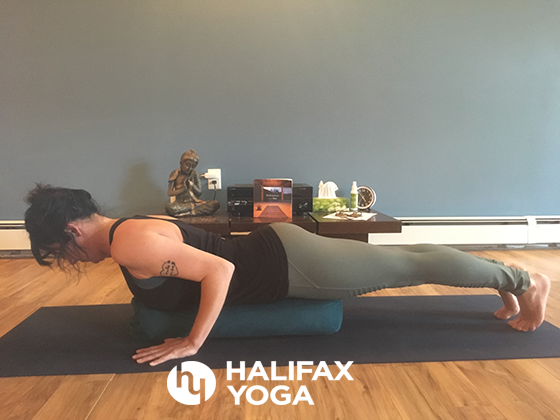 A Certified Yoga Instructor at the 200hr Level, Nicole Clarke has been teaching in the Halifax Yoga Community for a little over 5 years. A Social Service Provider and Reiki Master/ Teacher, Nicole harbours vested passion in holding space for those coming into their own healing and is known for her spiritual reflections, with a side of humour, in her teachings. Her growing edge is incorporating the wisdom of the physical body and integrating such awareness in the practice of yoga; on and off of the mat!